Our newest film, Healing Justice, explores the causes and consequences of the current American justice system and its effect on marginalized communities. The film walks back through the history of violence that has led to our current system, bringing into focus the histories of trauma – on a personal, interpersonal, community, and generational level. This powerful documentary addresses the school-to-prison pipeline, the need for comprehensive criminal justice reform, and the importance of healing and restorative practices. How do our current structures discount and dehumanize young people of color as well as our poorest and most vulnerable citizens? How does trauma impact us personally, interpersonally, as a community, and throughout generations? How do these histories affect who is perceived as a ‘perpetrator’ and a ‘victim’ of violence? From the larger structure of the legal system to how we treat youth in our communities, what are the alternatives to these models of addressing conflict? How can we address and change the racism embedded in punitive judicial systems? 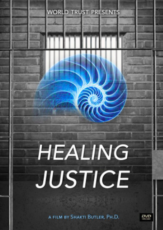 Why is healing on both individual and collective levels so important – and so often overlooked – components of justice? How can , such as restorative justice, be used to shift the way we address crime and violence in our communities to produce safer, healthier, thriving communities for all?